Not only is this a player but it is a reproducer with a Recordo system. When we acquired the piano it was completely apart and in boxes, plate out, case apart, no strings and so forth. An amazing sequence of events lead to its arrival here. As with many player pianos the player system is in the way of the tuning pins. So much so in this piano that the upper stack must be removed for tuning. Somewhere in its past the upper stack had been removed and kept out of the piano. Thirty years later the stack found its way to the curb for trash pick up. A tuner who was driving by saw that there was still a roll on it and took the whole stack home to retrieve the roll. Many more years passed and in my search for Recordo parts to rebuild the missing stack, I happened to contact this tuner who had left the stack in his attic for years. Unbeknownst to either of us, he had the missing stack. When I bought the old parts from him, we found that it dropped right into place like it had been removed the day before. So now all the parts are back together where they belong including the wayward stack. 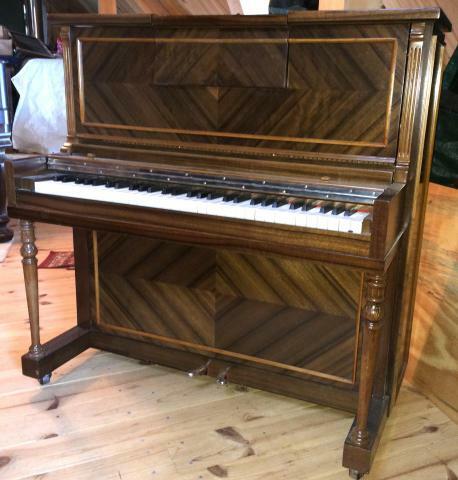 The small pianos have been nicknamed Tom Thumb because of their size. There is hardly any room inside them as it is, so the fitting of a reproducing mechanism within, is a sight to behold. Though the keys are full size, there are only 65 of them because of the reduced size. The keys are closer to the floor than in a conventional upright in order to preserve the overall look of an upright.